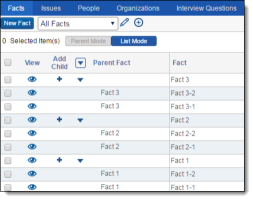 Relativity Case Dynamics, formerly Fact Manager, assists in organizing and analyzing case details such as facts, issues, organizations, people, interview questions, and documents. This analysis helps identify strengths and weaknesses in litigation strategy and leads to better preparation for depositions, interviews, and trial. Imagine you're an attorney preparing for the biggest and most complicated case of your career. 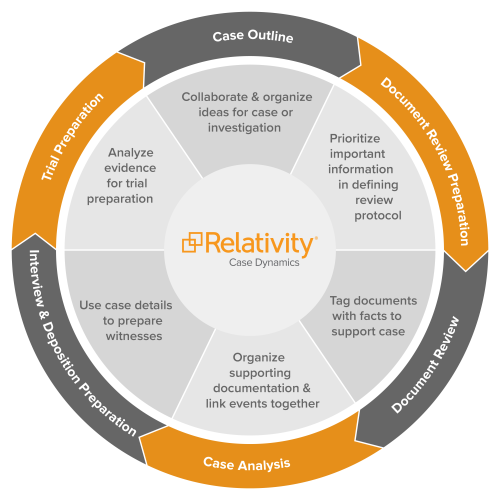 You're already using Relativity as your document review system, but with all the case details you're gathering, you need a centralized place to organize the people, facts, issues, organizations, and documents pertaining to the case. You're using a generic filing system but are having trouble keeping your information synced with the case documents. Using Case Dynamics, you start tracking case details right in the workspace. You create new facts, or pieces of information about the case, and link existing facts to documents on-the-fly during the document review phase. This helps you associate information with particular documents in Relativity. As you prepare for the deposition, you track client interview questions and answers in Case Dynamics for future case reference. You generate a timeline report with color-coded facts in Case Dynamics to manage and view the case as it progresses. You link existing facts to a report, then generate the report to show your client during the deposition. Once you've trimmed your document set and it's time for trial, generate an offline report in HTML file format and dynamically access documents in the courtroom for presentation using the report hyperlinks. Note: The last version of the Fact Manager rap file is compatible with the first release of Relativity 9.6. Starting in Relativity 9.6.110.36 , the Case Dynamics rebrand takes effect. The functionality between Case Dynamics and Fact Manager is still the same. Case Dynamics correlates facts and issues in all stages of the case life cycle. Identify initial possible issues, people, etc. Use pre-organized case details to prepare witnesses. Use information gathered to organize and analyze details for trial preparation. You can install the Case Dynamics application on your current Relativity instance. Only a user with the appropriate system admin rights can import application schema. You should install/upgrade during off-hours as this disrupts workspaces services and causes them to be inaccessible during the install/upgrade period. 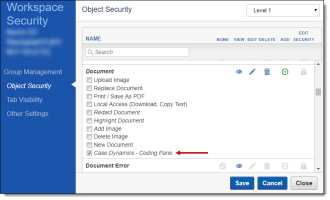 Ensure that you have access to the Case Dynamics - Coding Pane permission. 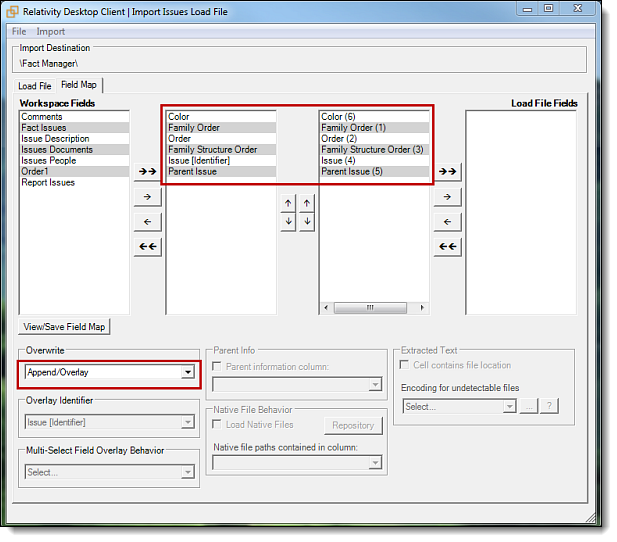 This permission allows group members to use the Case Dynamics coding pane. 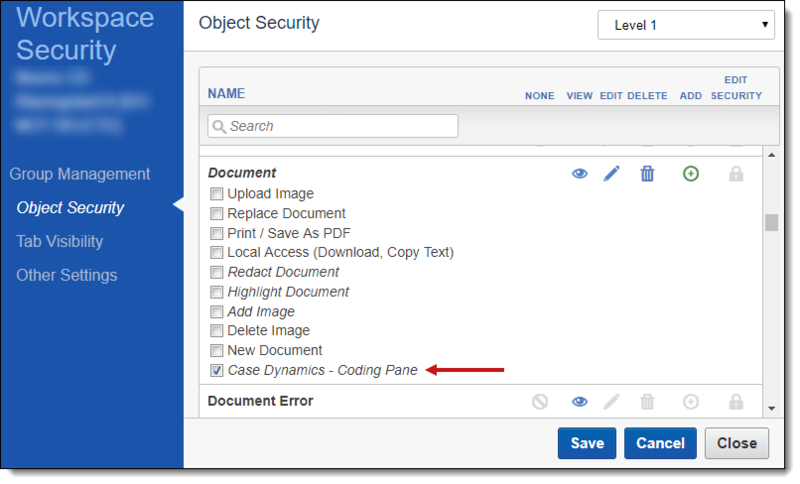 Without this permission, you will not be able to see the Case Dynamics coding pane link that allows you to access the Case Dynamics coding pane when reviewing documents. For more information on security permissions for Case Dynamics, see Security Permissions. Installation Guide - provided in the Installation Package .zip file. Reference Guide - provided in the Installation Package .zip file. The Case Dynamics application is available for download in the Relativity Community. 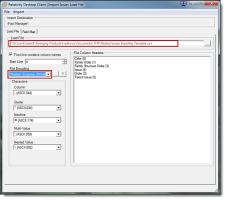 Use the steps below to import Case Dynamics using the Import from file option. Click the Relativity Applications tab. Click the New Relativity Application. Next to Application Type, select Import From File for Application Type. Click Choose File and select the Case Dynamics Schema. Click Open. The following categories on the form should auto-populate: Application Information, Application Artifacts, and Map Fields. Note: You can link the unlinked fields to existing fields, or you can proceed with the import and all unlinked fields automatically populate. Click Import. If the install is successful, the Case Dynamics tab is visible, and Case Dynamics is listed on the All Relativity Applications view. To upgrade the application, download the newly released schema from the Relativity Community and import it into the Application Library. You can find information about Case Dynamics product updates in the Relativity release notes. Note: If you have made any modifications to Case Dynamics, those will be lost upon upgrade. You must configure certain permissions for proper functionality of Case Dynamics. Navigate to the Workspace Details tab. Click Edit Permissions for a group on the Group Management tab. Or, click Object Security and select a group from the Current Group drop-down menu. Case Dynamics is now is successfully configured. All other Relativity permissions behave in standard fashion within Case Dynamics. As of the Relativity March 30, 2016 product update, Case Dynamics are now permission-aware, meaning that system admins can now control which items a user can use. For example, if the user doesn't have Delete permissions on the Fact item, they won't see the Mass Delete option. Access Case Dynamics using the Case Dynamics tab located in the workspace where you installed the application. Note: The Case Dynamics application must be installed on each workspace. Note: The following illustrates screen content based on the Fact sub-tab. The data entry screens and practices for the libraries are similar. Click the Case Dynamics tab. To view additional details, click . You can see the number of items linked to an item in the inline view. If you hover over this number, a pop-up dialog box appears where you can click on an item's name to see item info in a pop-up window. You can also create new issue, people, organization, and interview question items, or link fact and document items from the pop-up dialog box. 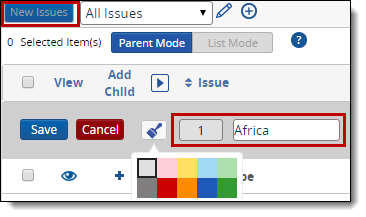 You can set Parent Mode or List Mode as the default inline view by clicking the Parent Mode or List Mode button. You can add reflective fields to inline views. Case Dynamics caps how many linked items display in inline views in order to streamline the inline coding process. Add or edit fact information from the Fact Detail screen. See Fact detail fields. In the Fact field, type the "@" symbol followed by one or more letters to bring up the auto-fill feature. Case Dynamics presents a pop-up list of People and Organizations based on the letters you type. 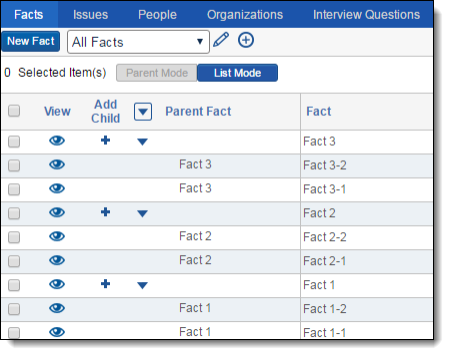 Click the name of the Person or Organization to add them to the details of your Fact field. Case Dynamics also automatically populates the Fact People or Fact Organizations field to link to your Fact. 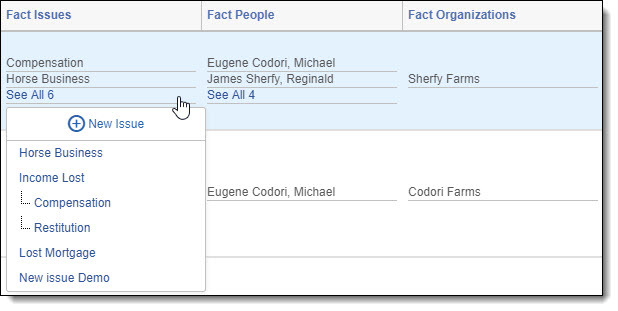 Click to remove an auto-filled person or organization from your fact. From a layout, click Save. From a row, use the keyboard shortcut, Ctrl + S. Use the keyboard shortcut Ctrl + N to save and open a new fact row. To browse between facts on the Fact Detail layout, use the navigation bar in the top right corner. Click the arrows to go to the first, previous, next, or last fact. Note: Facts are referred to as records in the navigation bar. Use the following shortcuts and icons when inline coding. Add Child. See Adding a Child. You can view fact details using two different layouts. The Fact Basic Layout organizes item information using tabbed display, and the Fact Extended Layout organizes item information as a list. Both layouts contain the same fields. Fact - A brief title for the fact. This is a required field. Issues - Association field to link issues to the fact. Impact - Indicates importance of the fact to the case - the choice selections can be customized to a user’s workflow. Status - Displays the status of the fact - the choice selections can be customized to a user’s workflow. Description - A field for describing fact in greater detail. Date Type - Designates whether the event occurred on or around a single date, or between two dates. Primary Fact Date - Denotes the date when the fact occurred, or the start date for an event that occurred between certain dates, including time. End Date - Records the completion of a fact that took place over a period of greater than one day, including time. Excerpt - Stores extracted relevant document text supporting the fact. Fact Document - Links workspace documents to the fact. Fact Organizations - Links a party or multiple parties, usually corporate entities to the fact. Fact People - Links people to the fact. Fact Interview Question - Links interview questions to the fact. Comments - Additional information, mental impressions or messages to colleagues, related to the fact. System Last Modified By - The name of the user who last modified the entry. System Last Modified On - The date and time the entry was last modified. For other library items, see Library data entry fields. Click in the inline view pop-up dialog box. Add or edit issue information from the Issue Detail screen. See Issue detail fields. Click an issue from the pop-up dialog box, then click Edit in the pop-up window. From a row, use the keyboard shortcut, Ctrl + S. Use the keyboard shortcut Ctrl + N to save and open a new issue row. You can view issue details using two different layouts. The Issue Basic Layout organizes item information using tabbed display, and the Issue Extended Layout organizes item information as a list. Both layouts contain the same fields. You can nest or add a Child Fact to Facts, Issues, and Interview Questions. Click next to the Parent Fact name in the row. Save the child using shortcut keys Ctrl + S once you populate the fields or save and add a new child using Ctrl + N.
Once you've created a Child Fact, the icon appears next to the Parent Fact. Click the arrow to collapse or expand the Child Facts. Family Order - This whole number field contains the numeric value of parent issues only. Order - This fixed-length text field contains the numeric values for parent and child issues. Family Structure Order - This whole number field helps create the outline structure of all the issues. You can organize facts and issues using several methods, including nesting, numeric ordering, drag and drop, and color coding. You can create facts/issues and nest sub-facts/sub-issues, also known as creating parent/child relationships. There is no nesting level cap. The numeric ordering functionality occurs when creating a fact or issue. The values auto increment and are editable. As you build items out, the numbering takes the highest number value and increments it by 1 for the next item. Children, or sub-facts/sub-issues also inherit the color of the parent fact/issue. Nest the item in another fact/issue. Reorder the item above or below a fact/issue. A blue bar indicates where the item will go when you release your mouse click. Note: The drag and drop functionality is only available on the child level. Parent topics cannot be reordered via drag and drop. To reorder parent topics, change their numeric value and refresh the page. In the following nesting example, dropping 2.1.3.2 Venice into 2.1.3 Italy will nest Venice as a sub-item of Italy. In the following reordering example, dropping 2.1.3 Italy in between will renumber Italy to 2.1.2. The item that you click and drag is automatically associated with the parent item to which you assign. If you delete a parent item with children, Case Dynamics will unlink any associated children instead of deleting the child items. You can delete the child facts/issues by selecting the checkbox(es) next to the child item and performing a mass delete. Use color coding to visually distinguish the parent facts/issues and any of its children from the other parent groups. Create a new fact or issue, or press Ctrl + A. By default, a new fact/issue is gray. Select to apply a new color from the palette. You can change the parent item color at any point by selecting the item, then . The chosen parent item color is delineated with the same colored line at the bottom of each parent item. 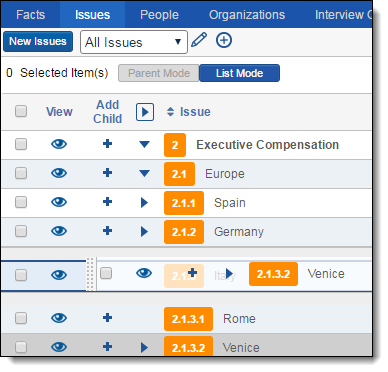 The pop-up dialog box in the inline list view helps you visualize hierarchies within facts, issues, and interview questions to demonstrate parent/child relationships. It also facilitates linking items. When you create a new item through the inline list, it is automatically linked. 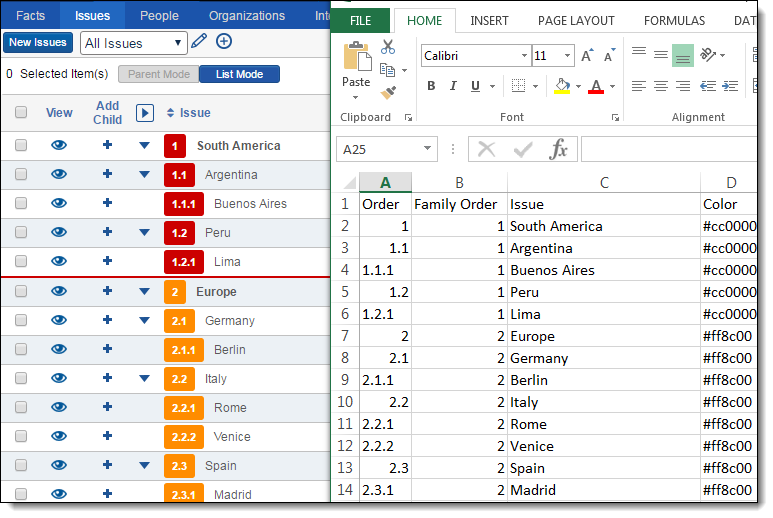 You can import an Excel file with Facts, People, or Issues with assigned numeric order and color coding to the corresponding Case Dynamics item. 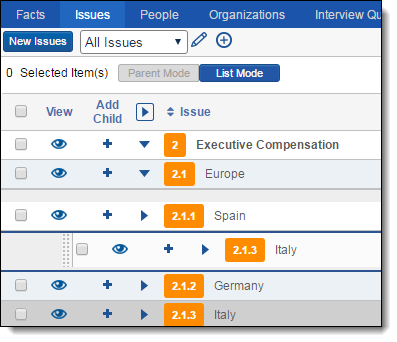 For example, you might import a contact list to the People item or a list of issues to the Issues item. 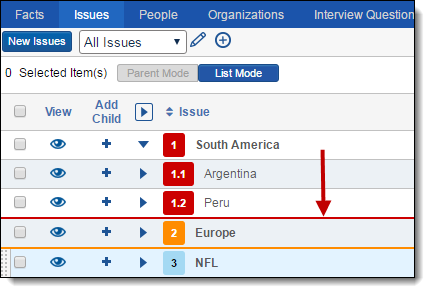 The example below uses Issues to show how each issue and sub-issue corresponds to the import file. Download a sample Nested Issues Import Template file for use, and refer to the below list of color coding hex values when customizing your Issues import. To import issues into Case Dynamics using the Relativity Desktop Client (RDC). Ensure that you've formatted the Excel import file correctly. 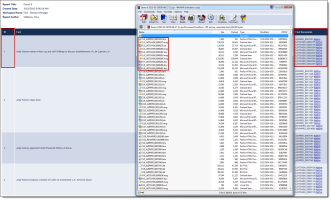 Open the RDC and select the Case Dynamics workspace to which you are importing issues. Ensure the following settings are selected. Map the appropriate fields and ensure Append/Overlay is selected before import. Click Import > Import File. 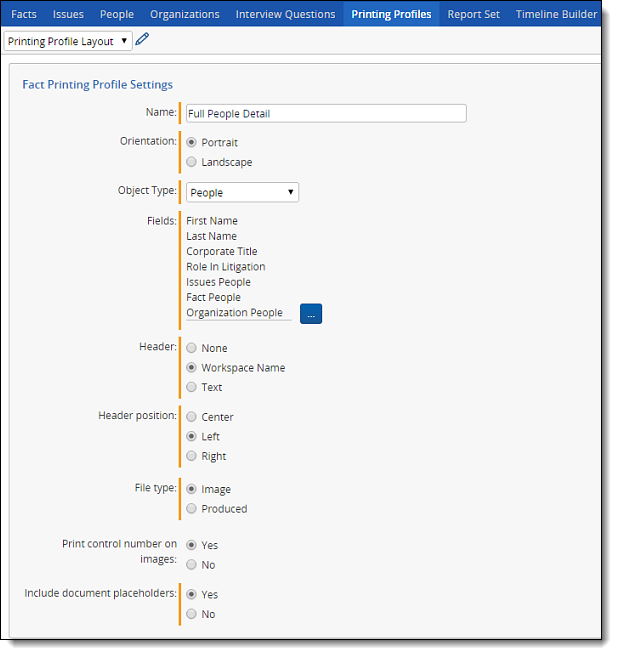 In order to print from Case Dynamics, you must create a Printing Profile. 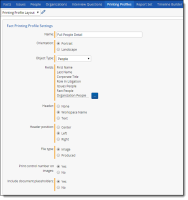 Navigate to the Printing Profile sub-tab, and then click New Printing Profile. Add information in the Printing profile layout. See Printing profile layout fields. Select the facts you want to print. Click the mass actions drop-down and select Print. Select the profile that you just created. Name - enter the name of the printing profile. Orientation - select an orientation for the printout sheet. Object Type - select an object type from the drop-down list. The selected object type determines the available fields to choose from. 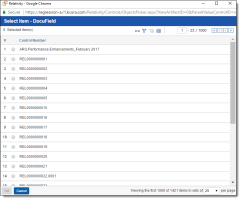 Fields - click to select available object fields to include on the fact printout sheet. None - select this option to not include a header name. Workspace Name - select this option to use the Workspace Name as the printing profile name. Text - select this option to enter a custom header. Header position - select a position for the header. File type - select an Image or Produced file type. Print control number on images - select whether to print the control number on imaged documents. Include document placeholders - select whether to include placeholders for documents that have not been imaged or produced. 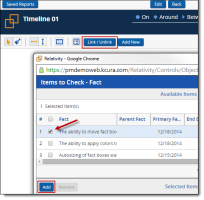 When reviewing a document, you can create a new fact and link it directly to the active document. When viewing an item, you can attach documents directly from your desktop without importing them into Relativity via the RDC or Web Import. You can do this in the Attachments field. Click the item's tab, for example, the Facts tab. Select a Fact and click the View icon. The Fact Details layout appears. In the Attachments field, click New. The Fact Attachment Layout appears. Click Choose File. Navigate to and select the file you want to upload. Click Save. 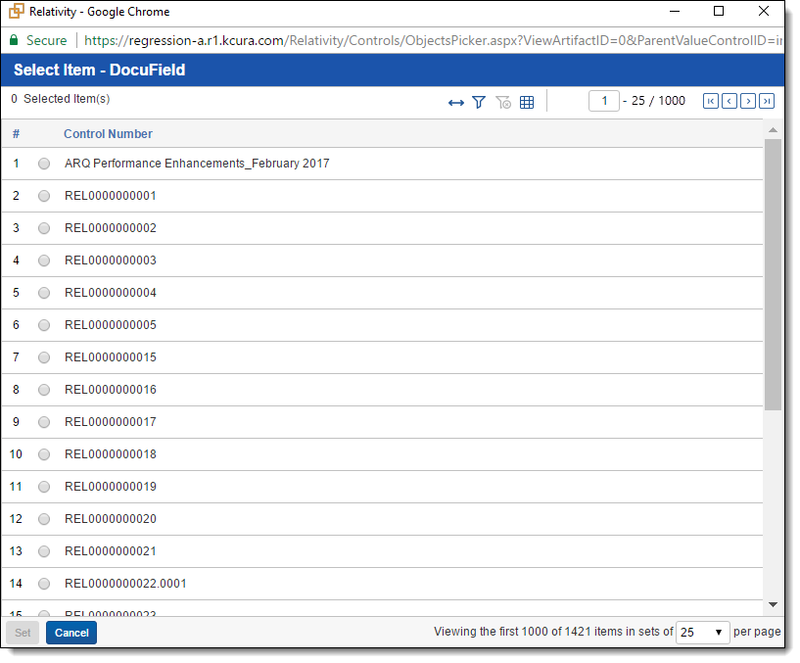 The documents appear in the Attachments field. To delete an attached document, select the checkbox next to the appropriate documents and click Delete. A pop-up confirmation appears. Click Delete again. Click in the inline view document pop-up dialog box. In the pop-up window, select the document(s) you would like to link. If there are no documents linked to the item, you will see . Click and select the documents you would like to link from the pop-up window. 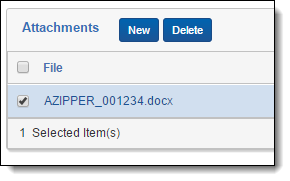 Once the document is linked, you can click on the document name and the Standalone Document Viewer will appear. Being able to visualize the chronology of Facts adds value during the stages of a case life cycle. Document the basic flow of events after an initial client consultation. Identify behavioral patterns that aid case strategy development. Pinpoint where to search for documents during discovery. Serve as a color-coded illustrative exhibit during trial. Click the Timeline builder sub-tab. Select Show Report Title if you want to include the Report Title on the report. (Optional) Enter Conditions based on a selected field. Conditions behave as a hybrid between saved searches and keyword searches. Therefore, whatever field you select, the corresponding operator appears. See Saved search. For example, the following condition returns all applicable facts to the selected user(s). Operator - any of these. Value - click to select the available values. In this case, user(s). AND or OR Operators - use these operators to connect the criterion in each row. (Optional) Click Add another condition to build out your conditions, and select AND or OR between multiple conditions to set additional logic. If you did not add conditions, you can display existing Facts, by clicking Link/Unlink. From the pop-up picker, select the Fact(s) you want to appear in the timeline. Click Add, and then click Set. To add a new Fact, click Add New. Fill in the fields in the pop-up and click Save. The fact is added to your timeline report. Fact - A brief title for the fact. Primary Fact Date - Denotes the date when the fact occurred, or the start date for an event that occurred between certain dates. Beginning in 4.6.202.3, you can also select a specific time. End Date - Records the completion of a fact that took place over a period of greater than one day. Beginning in 4.6.202.3, you can also select a specific time. Timeline Color - (Optional). Select a color to apply to the new fact. See Applying a color to a fact. Click Saved Report(s) to access all other Case Dynamics reports. The following Timeline Builder options are available to customize your Timeline report. The option is orange when selected and blue when de-selected. - Draw Mode. This is the default mode, click and drag facts around on the timeline to your specification. - Paint Mode. Select this mode to apply a color to a fact. See Applying a color to a fact. - Horizontal Timeline. This is the default display mode, and displays the timeline horizontally. - Vertical Timeline. Display the timeline vertically. - Enable/Disable Color Legend. Select this mode to show/hide the color legend. Only used colors appear in the legend. - Enable /Disable Borders. Select this mode to enable the dotted border guidelines when saving the report to a PDF. Any fact outside of the border won't appear in the PDF report. To edit a color name, click the color in the legend and enter a new name. - Compress. Select this mode to compress the number of facts that fit on your timeline. - Organize by Time. Select this mode to organize facts on the timeline by time. You can select this mode beginning in Beginning in 4.6.202.3. - Organize by Date. Select this mode to organize facts on the timeline by date. You can select this mode beginning in Beginning in 4.6.202.3. - Email the Timeline report URL to someone. The person that you send this email to must have Relativity access. - Export the report in the selected file type format (PDF, XLS, CSV, IMAGE). 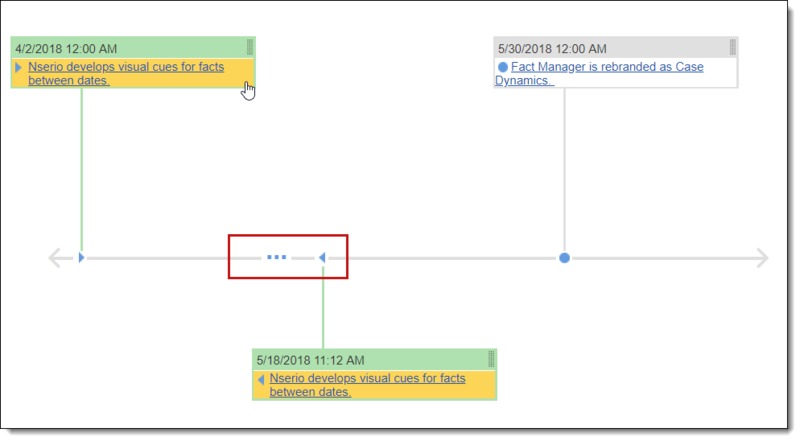 For XLS exports, the report columns that appear here are controlled by the Timeline Facts view in the Facts sub-tab. For IMAGE exports, reports are saved as a JPG. Create Offline Report - Select this button to create your offline report containing all of the pre-selected facts from your timeline report. See Offline report. Beginning in 4.6.202.3, new visual cues exist.To clearly present facts in between dates, these facts appear on a timeline connected by three dots. These facts also appear between two arrows on the timeline and are highlighted in a yellow color when selected. Ensure that you're in Paint Mode. Select a color from the palette. Locate and click the fact that you wish to change color. To change the fact to a different color, repeat steps 2-3. Note: You can select the default light gray color to "reset" the fact color. 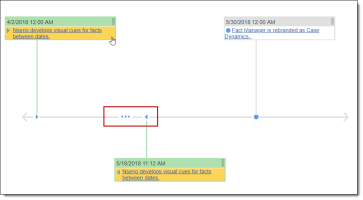 With the Outlines feature in Case Dynamics, you can easily build case narratives within Relativity. 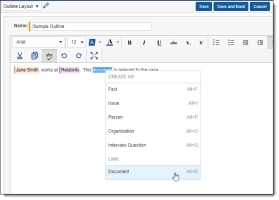 Within the Outlines tab, you can create free-form outlines, link to existing Case Dynamics items and documents, and create new Case Dynamics items. The Outlines tab includes a sample outline that gives a brief overview of how to use the feature and lets you test creating and linking items to the outline. To edit an outline, click . The Outline layout appears. Enter your text in the rich text editor. You can also copy and paste directly from Word into the outline. If one user is editing an outline, the outline will be locked and available as read-only. A warning message appears to let users know the outline is being modified and who is editing the outline. Note: Before unlocking an outline, we recommend making sure no one is currently making edits. If you unlock an outline while edits are in progress, you may lose those changes. Beginning in 9.6.50.31, you can edit a locked outline. Make sure the Edition Locked field is added to a view in the Outlines tab. The Edition Locked field will read Yes. Click Yes to enable the field for editing. Click Yes again to edit the field. You can now edit the outline. For more information on the rich text editor's features, see Using the rich text editor. Note: We recommend not editing Outline layouts as this may have adverse effects on Outlines functionality. Beginning in 9.6.50.31, you can set up a saved font color and style for users. Click the User format settings toggle ( )found along the top of the rich text editor. The font icon ( )is highlighted. Click the drop-down to open the font options. Choose the designated font formatting for the user. To remove the saved font, click the User format settings toggle to turn it off. You can create facts, people, organizations, and interview questions, or link documents from within your outline. Highlight a section of text. 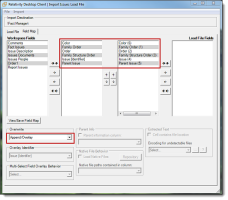 Right-click and then select the Case Dynamics item you want to create. You can also create a new Case Dynamics item from within an outline using keyboard shortcuts. For more information, see Outlines keyboard shortcuts. Fact - a brief title for the fact. This field auto-populates with the text you highlighted. Primary Fact Date - the date when the fact occurred, or the start date for an event that occurred between certain date. End Date -the completion of a fact that took place over a period of greater than one day. Click Add [Item Name] to create your item. Click Cancel to return to your outline without creating a new item. If you want to view and/or edit the full item details of an item within an outline, right-click on the item tag, and then click View. 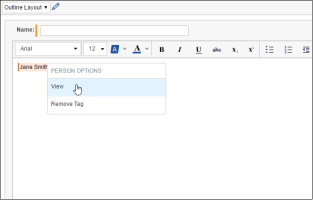 To remove an item tag from within an outline, right-click on the item tag, and then click Remove Tag. Note: Removing an item tag removes the item created on the outline. Right click and select Link to document. A pop-up window appears. Navigate to and select the document within Relativity you would like to link to the outline. A hyperlink in the outline appears linking directly to the document. You can link to existing Case Dynamics items as you type using the auto-fill feature. In the text editor, type the "@" symbol followed by one or more letters to bring up the auto-fill feature. Case Dynamics presents a pop-up list of facts, issues, people, organizations, or interview questions based on the letters you type. If you want to view and/or edit the full item details of an item within an outline, right-click on the item tag, and then click View. If a document is linked to an item, that document is automatically linked to the outline. 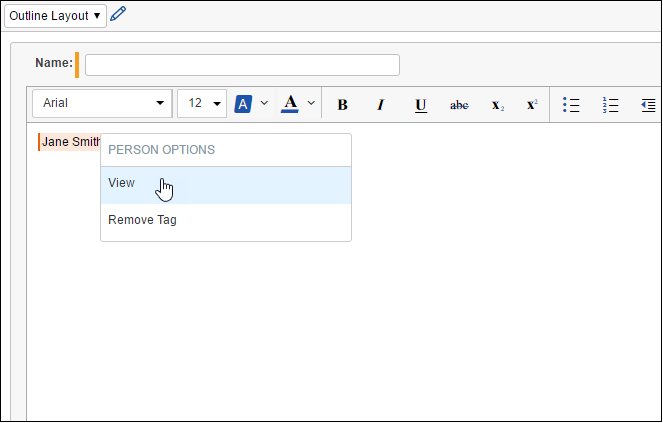 If an item is tagged within an Outline tag, the tags are automatically linked to each other. To remove an item tag from within an outline, right-click on the item tag, and then click Remove Tag. Any documents linked to that item will also be unlinked from the outline. If you tag a Case Dynamics item in the text editor and then update or delete that item outside the outline, the outline doesn't update automatically. Click Check Conflicts to resolve or ignore conflicts. When you save an outline, the outline appears in View mode. You can also open View mode by clicking from the Outlines tab. From View mode, you can view the full details of an outline including all facts, issues, people, organizations, and interview questions linked to the outline. 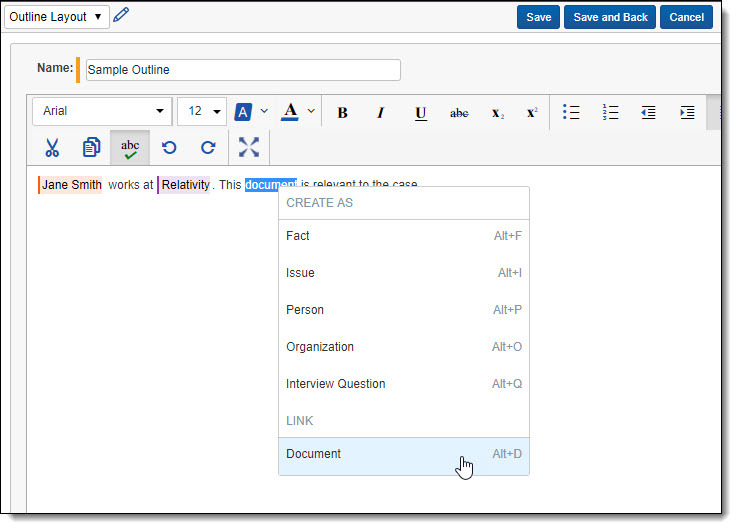 You can also link documents to the outline and export the outline as a Word document. An option to download export history of Outline export date, user, and files is also available. Click Link. a pop-up appears. Select the documents you want to link to your outline, and then click Add. To unlink documents from an outline, select the documents you want to unlink, and then click Unlink. Beginning in 9.6.134.78, you can edit the view when linking to documents. If you would like to keep the changes made to the Linking Documents view upon upgrading Case Dynamics, you must copy the existing Linking Documents View and name it Linking Documents Custom. This way, you do not have to unlock the application again to make changes. To export an outline, click the Export Outline drop-down in the Outline Text section, and then click Word. You can export documents linked to an outline by checking Include Documents. The documents will download as a zip file along with the outline text. If you linked any documents within the outline, they will appear as hyperlinks. Clicking on the hyperlinks opens the documents in the zip file. Export File - the files exported along with the Outline export. System Created By - the user who completed the export. System Created On - the date the files were exported. You can export a list of the Export history as a .csv file by clicking the export button . You can view Facts, Issues, People, Interview Questions, and Related Documents without Internet access with an Offline Fact report. This is a convenient feature for reviewing case information while preparing for and during interviews, depositions, and trial. Note: If you would like dates in the offline report to appear with UK date formatting, change your language settings in your browser to English (United Kingdom). Click the Report Set sub-tab. Click the New Report Set button. Enter information in the Report Set fields. See Report Set fields. 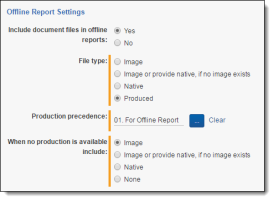 From the Report set type drop-down, select Offline Report. The Offline Report Setting options display. Note: The Include document files in offline reports field is set to Yes by default. If you don't want to include documents in the report, select No and proceed to step 7. Enter information in the Offline Report Settings fields. See Offline Report Settings fields. Note: The order numbers that appear next to the selected productions in the Production precedence field are not a part of the actual production set name. These numbers are only applied to reflect the order precedence for this report. Select Link to include any facts, issues, people, or questions. Select the check boxes next to the fact(s), issue(s), people, or question(s). Click Add, then click Set. Once linked, the facts, issues, people, or questions appear under the Fact (Report Facts) and/or the issues (Report issues) sections. From the Report Set Console, click Generate Report. A .ZIP dialog displays. Save this to a desired location. Open and extract the .ZIP file to view the fact, issues, people, or question files. In the .HTML report page, click the hyperlinks to view the applicable document in the desired original format. The Documents folder in the .ZIP file is contains sub document fact, issue, people, or question folders, depending on the item type selected in the Offline report settings. In the Documents folder, you can associate documents to the applicable facts, issues, people, or question files. For example, if you opened the Facts sub folder, you'd see a document numbering convention starting with F1.0_AZipper_0007293.htm. On the .html report page, you can use the ID column to match up all of the F1 documents to the files listed on the .html report. Name - the report file name in Case Dynamics. Report title - the report title that appears on the offline report. Show report title - select yes or no to include the report title on the final report. Report set type - select Offline Report or Master Report. See Master report. Include document files in offline reports - determine whether to include documents in the offline report. The field is set to Yes by default and contains additional file type options below. File type - the document version included in the Offline report. Image - this option only includes the imaged version of the documents. If an image doesn't exist, a document won't be included. Image or provide native, if no image exists - this option tells Case Dynamics to first look for an imaged version of a document, and if found the image is included in the report. If no image exists, Case Dynamics looks for a native and if a native exists, the native is included in the report. Native - this option only includes the native version of the documents linked to Facts and/or Issues. Produced - this option is used to set a production precedence. 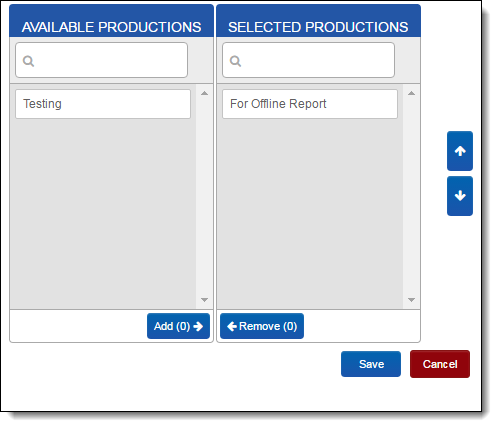 Production precedence - click to select the desired production(s) in the workspace. 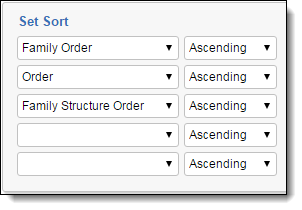 Click Add, then use the up or down arrows to set a production order precedence. When no production is available include - the document version included in the Offline report. Use these options in conjunction with the Production precedence field. 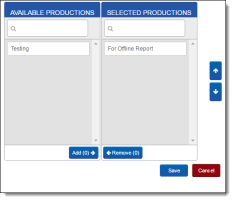 Image - this option tells Fact Managers to look for documents to be a part of the previously selected production sets. If the document is not in any of the production sets, then Case Dynamics looks for an imaged version of the document. If the image exists, it is included in the report. If no image exists, no document is included in the report. 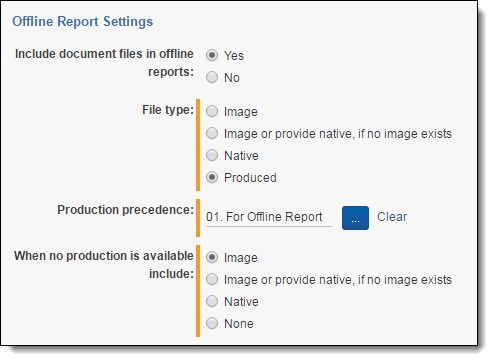 Image or provide native, if no image exists - this option tells Case Dynamics to look for an imaged version of a document, and if found the image is included in the report. If no image exists, Case Dynamics looks for a native and if a native exists, the native is included in the report. None - this option tells Case Dynamics to only include produced documents. If a Fact or an Issue is linked to a document that is not produced, the document is not included in the report; only a control number displays. You can select views for exporting with the master report. With this report you can select all Case Dynamics views, including user created views, in one operation. This report can come in handy when archiving a case or if you need to review all the items in Case Dynamics. 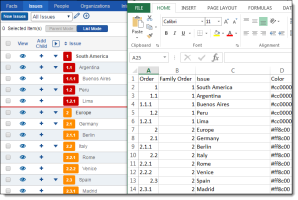 When generating this report, the output is an Excel document with workbook tabs for each selected view. Click New Report Set and select Master Report from the Report Set Type drop-down menu. Check the Views for exporting. The generated report appears in the Report File section. The following sections describe the library data entry fields used when adding or editing an Issue, Organization, People item, and Interview question. Role in Litigation - displays the roles for the person. The choice selections can be customized for your workflow. Corporate Title - displays the titles for the person. The choice selections can be customized for your workflow.